Good! Now, you might want to combine the tranquility and eagerness of fishing with the adrenaline, practicality, and awesome fun of using a kayak. But you’re not going to be using just any kayak out there; you need a specialized fishing kayak. With this, you will be able to maneuver the waters efficiently, paddling with ease. You’ll also have the freedom to sit, stand or squat comfortably and cast and reel effortlessly. But kayaks aren’t so affordable these days. Many of the good quality ones cost well over 1000, and these might be too expensive for you if you’re on a budget or you’re a beginner. The inexpensive ones, sadly, don’t offer good features and they’re not durable. That said, there are a few great models costing less than 1000 bucks. These give you all the features that the expensive kayaks offer. But, finding them isn’t easy. You have to sift through lots of bad models. Don’t fret. We’ve done the legwork for you. In this post, we’ll show you the best inexpensive models on Amazon. Read on to find the best fishing kayak under 1000 quickly and conveniently. In the table below, here are some researched product, that you can choose for your fishing. Need a strong kayak that can comfortably support two people? Maybe you have a young son, and you want to introduce him to fishing. Or you just have someone that you want to take along on your angling adventures. Well, Lifetime’s Two Person 10-foot model is the best budget fishing kayak you can find. It’s made from high density polyethylene, and it’s blow molded. That gives it superior strength and longevity. The weight capacity is 500 pounds. Hopefully, that’s adequate to carry you and your fishing partner plus a few supplies. There are two seats in the cockpit. These have nice, cozy backrests to keep you comfortable and stable while paddling. On either side of this boat are multiple footrests. These give you a platform to keep your legs stable and comfortable. The little boat comes with 2 paddles for you and your friend. What you’ll like about the paddles is that they’re lightweight, making it easy for you to row the boat. The light weight of the paddles makes them appropriate to use when teaching a kid how to row. The vessel’s hull is designed for excellent stability. For that, there’s very little worry about tipping over. With practice, you can even fish while standing. On the flipside, the vessel is heavy, meaning you will need to enlist help to carry it to the sea. But you can always get a cart to move it effortlessly outside the water. The other issue is that the seats are not very reliable especially if you have back issues. You might want to buy better seats and attach them. If you’re looking for the best fishing kayak under 1000 with a lightweight design and excellent stability, then the Sundolphin Journey 10 SS suits you perfectly. Even though this yak goes for less than 300 bucks, it comes with the usability of one of those premium models. This is a one-person kayak with a weight capacity of 280 pounds. It comes with one paddle and a holder for it on both sides. The holders are a huge perk, because they prevent the paddle from falling into the water when you’re fishing. That is truly convenient. As said before, the boat is lightweight – it weighs in at just over 40 pounds, making it easy to carry. The retractable carrying handles on the sides make transportation into and out of the water simple for you. With this model, you have enough space to carry a few rod holders, a tackle box, and even a dry storage for your mobile devices. There’s a good amount of space at the back of the boat, behind the chair. You can use it to keep your fish and supplies, and there are even pegs to hold the items. The boat measures 10 feet in length, and the sitting space is enough for a person who’s around 6’0 or lower. Downsides? Keeping still is a little tricky, probably due to the lightweight design. You might find yourself having to use the paddle to readjust your position. All in all, this is a great kayak for one person adventures. Are you tall and you’re wondering if there’s a kayak out there you can comfortably fit in? The Tamarack Angler 100 by Lifetime is just the model for you. This 10-foot kayak is designed to accommodate people that are up to 6’3. It has plenty of leg space to make sure you’re comfortable while taking a trip down the waters. Comfort is further boosted by the foot rests, which allow you to put your legs in your ideal position whether bent or straightened. Crafted from polyethylene that is high-density and UV-protected, the boat is strong and durable. It goes a long way without getting damaged by the water or the sun. Most models come with just a seat back, but this one comes with a seat as well. Both the seat and the seat back are padded for comfort. What’s more, the seat back is adjustable. You can easily tune it to your needs. This vessel comes with one double-sided oar. The oar is lightweight and easy to use even for a child above the age of 10. When you need to throw in your angling line, the two holders on the sides come in handy for holding your oar, so it doesn’t fall into the water. At both the front and the back of the vessel is a t-handle. This comes in helpful for transporting the boat. One person lifts the front while the other person lifts the rear. There’s plenty of room for keeping your supplies. The 6-inch storage compartments at the center and the rear are very useful for keeping the fish while the spaces at the front and the back of the kayak come in handy for the fishing supplies. The Tamarack Angler 100 by Lifetime might not be fast, but for fishing, it’s truly worthy. If you’re looking for something really cool, a kayak that will impress the other boaters/anglers, then you want to check out the Vibe Kayaks Skipjack 90. This 1-person sit-on vessel is designed beautifully with brilliant blue, white, and green colors. It looks truly magnificent. Apart from the beauty, the kayak is packed with great features that make it perfect for use. The first one that you will really love is the seat, which is designed for optimum comfort. This is not one of those hard kayak seats that leave you with numbness or that annoying feeling of pins and needles. It’s a comfy set that is cushioned and well-positioned. The length of the kayak is 9 feet while the weight is 46 pounds. That’s not too heavy to carry, is it? Besides, there’s a t-handle at the front and the back, and an extra 4 easy grip handles at the sides, making transportation a breeze. Storage is the least of your worries when using this boat. First off, there are two sealed storage compartments – one at the center and the other at the front. Apart from those, there’s a bag attached to the back of the seat rest, where you can store extra items. The free space at the back of the boat also serves as a perfect storage spot. The only drawback is that the seat is secured by straps, so it slides when you lie back with too much weight. 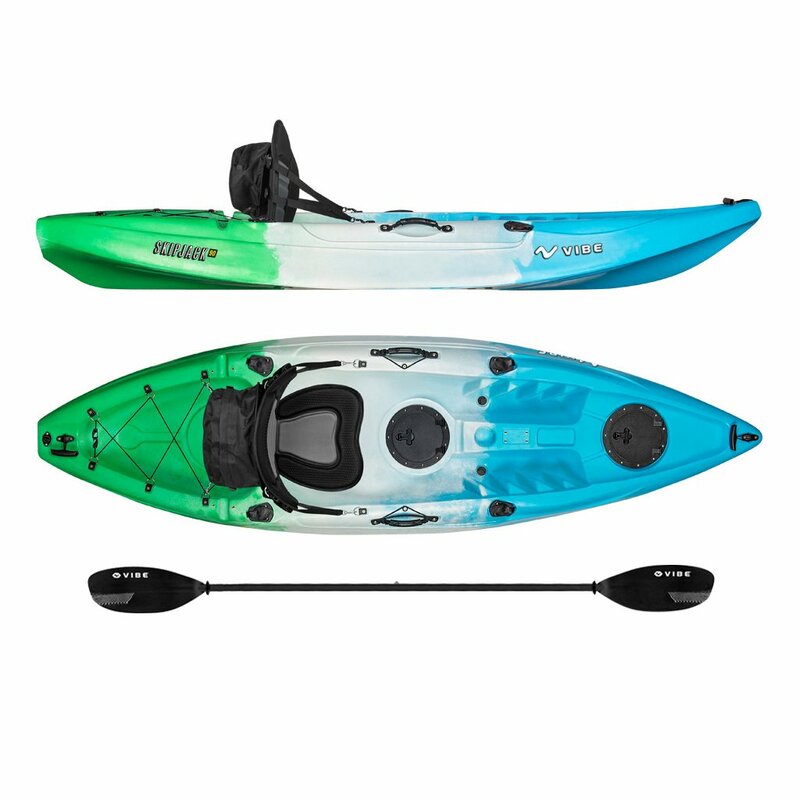 But for the stability, the ease of maneuvering, the compactness, the many storage areas, and the fact that you get everything needed, including plugs and paddle, this kayak is worth getting. If you’re looking for a kayak under 1000 that is great for trolling and that will help you reach spots other boats can’t, the Sevylor Colorado Fishing Kayak will serve you pretty good. This is an inflatable model that accommodates two people snugly. The 3-ft long vessel contains 2 seat rests, which can be adjusted to keep the users comfortable as they sail. One of the perks that you will notice when you start using it is the ability to move silently. That will enable you to stalk the fish nicely. Something else you will undoubtedly love is the robust construction. The vessel is made of 18-gauge PVC, making it very resilient against the water, the heat from the sun, and the other elements that try to damage it. The bottom is made of 1000 PVC tarpaulin and further enhanced with a thick nylon cover. This not only protects the boat from puncture but also ensures its durability. In the unlikely event that the vessel is punctured, the vessel will stay inflated and afloat. Why? It has multiple air chambers, and in case one chamber is punctured, the rest continue to support the boat. The boat even has an NMMA certification for its rugged nature and suitability for lake use. Many users have confirmed its longevity, and we bet you will too. The boat is very efficient, but if you want to expand its capabilities, you can always add a trolling motor to it. The Sevylor motor fittings make doing that a breeze. Unfortunately, the kayak doesn’t come with a paddle. On the brighter side, it comes with paddle holders on either side. You just have to get your preferred oar separately, and you’re good to go. Most kayaks are built such that if one feature is perfect, then you have to sacrifice something else. For instance, if the boat is stable, then the weight is too much. You know what makes the Vibe Kayaks Sea Ghost 130 the best fishing kayaks for the money? It offers you the best of both worlds for every feature. This vessel is quick and tracks perfectly, and it’s not heavy. Its reviews on the internet are some of the best for any product. The first feature that makes the kayak so good is the length – 13 feet. At this length, the vessel has enough space for anyone to sit comfily no matter their height. There are guys out there who are 6’4, and they say they never found a more comfortable kayak. But it’s not just the length that makes it suitable for comfort; the design of the padded seat and the foot rests make it super comfortable to sit on and paddle. The kayak weighs in at just 75 pounds. This might not be termed super light, but it’s not heavy either. Besides, there are comfort grip handles at the sides and at the front and rear, which make transportation a cinch. The length, the weight, and the narrow, streamlined design of the kayak are perfect for speed. The double-sided oar, which happens to be light and of just the right size, makes propulsion a breeze. Hence, if you need a kayak to go racing with friends, this one won’t let you down. From the light weight of just 45 pounds to the good amount of leg room for the tall guys, the reasons are endless why you should consider buying the Sundolphin Excursion. If you don’t have someone to help you carry your kayak to and from the water, a heavy vessel will be unsuitable. A lightweight model like the Excursion is what you should be thinking about. It has lots of gripping surfaces at the side, and there are also t-handles at the rear and front that can be used in transportation. This boat is made of uv-stabilized polyethylene. The material is pretty strong and resilient, ensuring your vessel lasts a long time. Comfort is a feature that is taken seriously with in the design process, it appears. There are protective thigh pads to keep your thighs from hurting in the long voyages. We’ve already mentioned that there’s plenty of leg room, but in addition to that, there are adjustable foot braces to boost your legs’ stability and comfort even further. The big, open cockpit gives you some freedom and allows you to stretch. There are two main complaints on this model. First, the seat’s bottom is not padded; only the back is. The bottom is hard, and that might give you a little discomfort. Many users say it’s not a big deal as you can just place a cushion there. The second complaint is about the lack of a paddle. Yes, that’s a drawback, but it’s far from being a deal breaker. 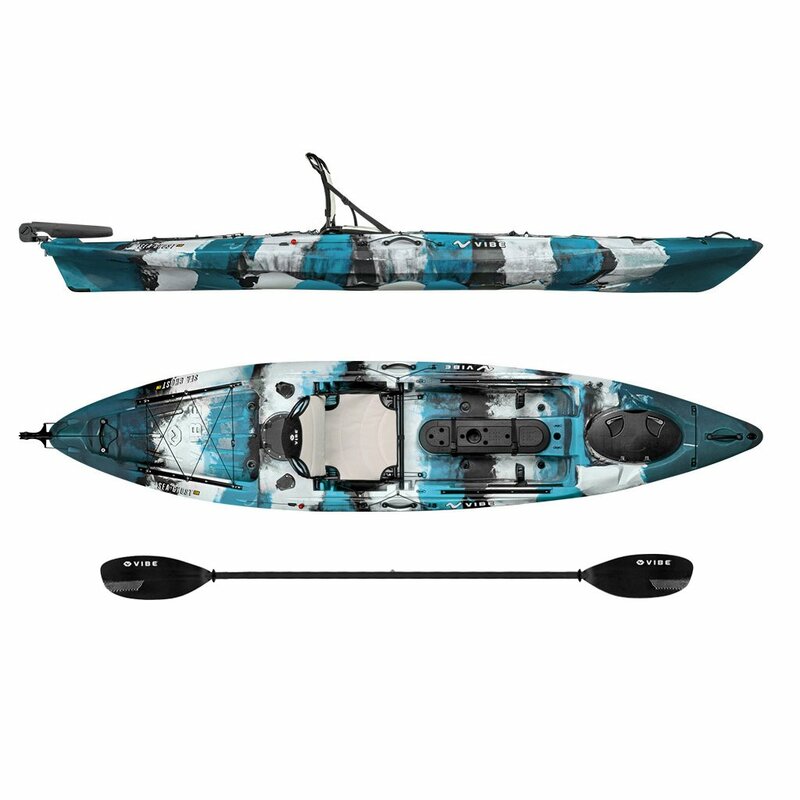 For all the stability, ease of tracking, durability, and comfort that the kayak offers, buying it and getting a paddle separately is definitely a good move. Need a good kayak that can carry two adults safely on a fishing trip? You got to try the BKC UH-TK181. This comes with two seats (sit-on) and with its 440-pound capacity, accommodating two adults shouldn’t be a problem. One issue that you can face with kayaks is that when you get out and into the water and try getting back on, the vessel might capsize. But guess what? This model is very stable, and with a just a tad of practice, you’ll be able to safely getting off and back on it. Here’s a big plus – let’s say you want to install a motor to enhance your kayak. With an ordinary model, that might be a little problematic as you have to make out a good spot for the installation. Things are very different with this model. Its transom comes pre-installed with threaded screw holes the motor. Pretty convenient, isn’t it? The seats are decent and comfortable; they’re supported by straps that you can adjust to fit the position you like. In front of each of the seats is a small sealable storage compartment where you can keep fish or stash your items. This kayak comes with two paddles. On either side, there are several handles for holding the paddles, allowing you and your partner to fish conveniently without the oars getting in the way. The BKC UH-TK181 is one of the most loved kayak models out there, with excellent customer ratings. However, it’s not free of drawbacks. Many people say the boat is unsuitable for choppy ocean waters. But, isn’t that what almost all kayaks are? Well, if you’re looking for a top-notch quality kayak for two people, don’t hesitate to get this one. Looking to go boating in a part of the ocean where you might have to deal with high tides? You can’t use any kayak out there as most kayaks are known to be only suitable for calm waters. What you need is something super stable, like the Vibe Kayaks Sea Ghost 110. When it comes to kayak stability, this model takes the trophy. This 1-person kayak weighs in at 62 pounds, making it neither light nor heavy. Enlisting the help of a friend, you can easily carry it into and out of the water. Being an 11-footer, the vessel has plenty of room for one person. Tracks are cut into the sides for you to rest your legs and stay comfortable. You will love the sturdiness and stability of this boat. It’s so strong that you can comfortably stand on it and fish without the fear of falling into the water. Aside from that is the amount of storage space on the vessel. At the far front is a large oval hatch 20 inches wide where you can store your items. There’s also a tank and hatch at the rear side as well as a large center console for keeping fishing lines, drinks, and whatever other supplies you might have. When you get to a point that’s rich with fish, you want to be able to keep the boat still to reel the line. The toe-operated rudder system, which is pre-installed, allows you to do that. The rudder system goes a long way, also, in saving you the energy of steering your vessel in the direction you want to take. Psst! – when yours arrives, you might want to check the screws on the handles to make certain they’re tight. If your weight is on the high side and you’re looking for a kayak that can support you, then you might want to check out the Ocean Kayak Prowler 13. This 1-person vessel has a weight capacity of 325 pounds, and it is extremely stable. With a length of 13 feet, the vessel also has lots of space, making it suitable for someone with long legs. There are even perfectly cut out foot steps to enable you to be comfortable whether you’re bending your legs or keeping them straight. When it comes to the ease of tracking, this boat is a champion. In the presence of rough tides, the boat doesn’t get knocked around much, thanks to its superb stability. If you’re looking to go boating in a place where the waters are not very calm, then this model will serve you well. At the front, there’s a large oval hatch. This is a sealed storage compartment that keeps items safe from the water, and hence it’s a great spot for keeping phones and other items you want to protect from the water. The bungee well at the back is really huge, providing you with ample space to store your goods. The only negative many people talk about is that the center hatch doesn’t keep the water out. Your items won’t get soaked unless too much water splashes into the boat. The issue can be fixed with a bigger rubber fitting. All in all, this kayak is a great selection for its excellent stability, ease of tracking, speed, and all the storage space it provides. Moreover, it reflects sun rays really nice, and that helps it to keep from overheating on a hot day. You are on a budget, and you’re having trouble finding a good, inexpensive kayak that will serve you well for years. Well, you just found it. Its name is the Emotion 90259 Renegade XT. This is a good under 500 dollars kayak packed with all the features you might be looking for. First off, this 13-footer has a very spacious cockpit. People as tall as 6’5 use it without any issues. The second perk is the light weight. Weighing in at just 49 pounds, the boat is easy to transport. There are gripping holes cut out at the sides at the back, as well as a comfort-grip handle at the front, and these are incredibly helpful for the transportation. For those of you with a big body, comfort is hard to find with a kayak. Well, if you’re looking for a yak that fits your weight, this Emotion model will do. It comes with a chair that is padded both at the seat bottom and the seat rest and in front of the seat, there’s plenty of space where you can stretch your legs. The grooves cut into the side are platforms for resting your feet to keep them from tiring too much. Another factor that makes the yak so suitable is the weight capacity. This model supports a weight of up to 325 pounds. One man weighing in at 318 pounds said the yak comfortably carries him along with his fishing supplies. Drawbacks? Spinning. This is not a model you want to use for a race. When you’re not paddling, the boat tends to go round and round along its axis. But on the brighter side, it’s an issue you can fix. You just need to install a skeg. That will keep you still when fishing. Perhaps your car is mid-sized or small, and you have limited space for a hard-shell kayak. Or, you just hate carrying hard-shell yaks. You know what you need? A good inflatable model. The Big Basin 3-Person Kayak by Sevylor is made of heavy-gauge PVC, and it’s robust enough for use in both the lakes and rivers. One issue with inflatable yaks is that they’re vulnerable to punctures. To deal with this snag, the manufacturer crafted the bottom from tarpaulin. This is a really tough material that is hard to pierce. And again, in case something manages to get through the sturdy wall and creates a puncture, the unit’s multiple air chambers prevent it from sinking. As you can see, the boat is designed to keep you safe. Worried about leaks? Don’t be. The system is airtight, preventing leaks efficiently. There’s something you should always consider when getting an inflatable boat. – Is it easy to inflate/deflate? Well, this one is fitted with a double-threaded Boston valve, making the inflation and the deflation a piece of cake. As you can see in the picture, this boat has three seats. Meaning? It’s a perfect model for group voyages. The weight limit is 490 pounds, meaning that in theory, it can carry 3 adults of regular weight. We, however, find it’s more practical to carry 2 adults and a kid or a hunting dog for the sake of comfort. You could remove one seat and carry just two people without a problem. The seats are padded and self-adjusting. They move to accommodate your sitting style and keep you relatively comfortable. The main issue with this boat is that is doesn’t come with paddles. You have to get these separately. Introducing the Elkton Outdoors Comorant – a 10-foot inflatable vessel that carries two grown-ups and their supplies without hassles. Ease of use and transportation and stability are some of the numerous reasons why this model is the best fishing kayak for beginners. It comes with all the accessories needed to hit the waters. That includes two double-sided paddles – these are made of aluminum to make them both lightweight and easy to handle, and also durable. There are 4 holders for the paddles. 4 of them trolling and six vertical. These help you a lot when you need to use the fishing line. Another important accessory that you get is the dual action pump. This pairs nicely with the nozzle, and it’s easy to use and effective, making inflation a breeze. The vessel is pretty stable and tracks great, but if you need to place it in a better position to maintain a straight line, then the skeg comes in handy. The skeg is super easy to attach. It just slides and locks into place. The last accessory is the carry bag. It contains plenty of space where you can keep various supplies. And that’s not all the storage you get. Behind the rear chair is some space for storing additional items. One of the most attractive features of this boat is its compactness. Deflated, the vessel measures 26x16x8 inches and inflated, it measures 10 feet x 35 inches x 16 inches. The overall weight is 27 pounds, making the kayak one of the lightest we’ve come across. Definitely easy to transport. Even with its lightweight nature, the vessel is incredibly strong, and can accommodate two people comfortably. The weight limit is 450 pounds. 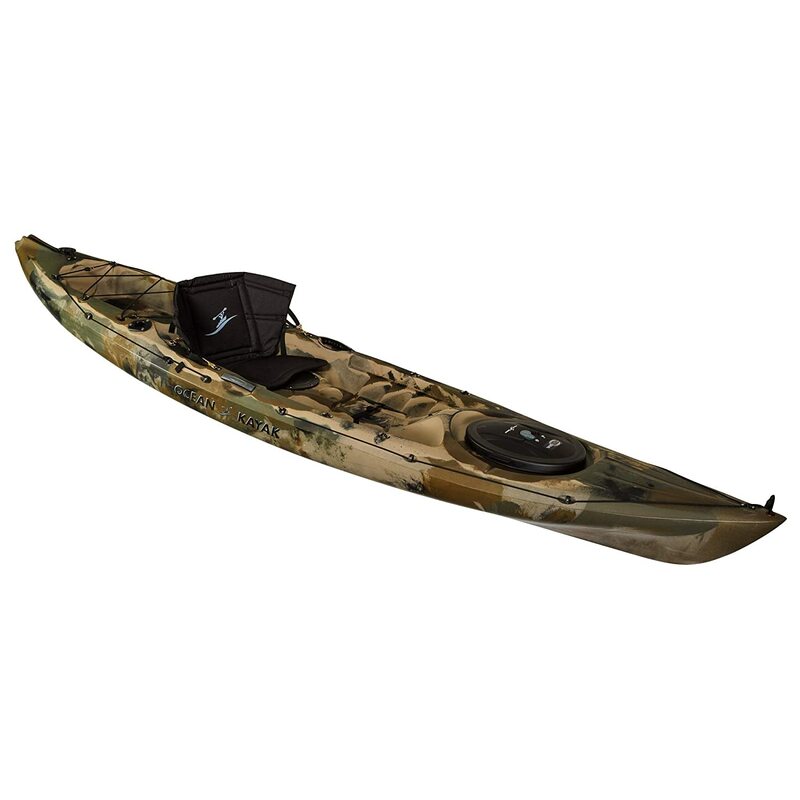 If longevity is what you’re looking for, then the Elkton Outdoors Tandem Fishing Kayak is just what you need. Made of rotomold injected body, the vessel is pretty sturdy, lasting years. It might get scratches, but it won’t get cracks for years. There are two handles at the sides and the front and rear, there are easy-grip surfaces to help you transport it conveniently with ease. The space inside is large enough for two people to sail with comfort. The two seats, one at the front and one at the back, are well cushioned to ensure you stay comfortable during those long expeditions. These seats are supported by straps that you can adjust to suit your sitting style and stay as relaxed as possible. One thing you’ll love about the seat is that they’re very well spaced out. For that, each sailor has plenty of space to spread their legs and enjoy maximum comfort. Grooves are cut into the sides, and these are great for resting your feet. This further augments the comfort of using the vessel. Storage is ample with this vessel. In front of each of the seats is a circular hatch with enough room for fish or electronic devices that you want to keep dry. And, at the back of the boat is a large storage compartment for keeping fishing lines and other bulkier supplies. We’ve noted 2 main issues with this model. The first one is that the seat backs are tricky to attach. The second one is that the directions are not very clear on how to attach the seat backs. These are a concern but definitely not a deal breaker. There are lots of videos on YouTube on how to install kayak seats, and these will be very helpful. But, the manufacturer might want to address that issue. You know what we liked about the 3 Waters Big Fish 105? It has a magnificent design. This under 1000 yak has green, white, and black colors that look sort of like the military uniforms, only a little brighter. This yak brings out that sense of masculinity pretty good, and if you’re a guy, you can be sure it will be very appropriate for you. The seat on this one is huge. It has a fine cushion that keeps you comfortable through those long fishing trips. A pair of straps supports the seat, and you can adjust them to suit your needs. Because of the seat’s creative design, you get to enjoy multiple configurations for sitting and standing. Low, high, reclined, and even flip away. The flip away configuration transforms the seat into a lean bar, enabling you to stand on the kayak comfortably. Performance is key, and with this vessel, you get to enjoy it at the optimal level. In that regard, the yak features an innovative design called the cathedral tri-hull. This design features a central pontoon and two outer channels surrounding it. Deep channels run in between. The technology is excellent, offering you great stability and minimal risks of capsizing. Need to take lots of gear and supplies on your fishing trip? No problem! Both at the bow and the stern, there are open storages where you can keep these items. There are more storages along the gunwales that you can use to store your supplies. Sadly, this yak doesn’t come with a paddle. But don’t let that stop you from enjoying the stability, power, ease of use and the great tracking of this vessel. You can get a paddle on Amazon for less than 30. What to Look for Before Buying Best Fishing Kayak Under $1000 Budget ? When buying a fishing kayak under 1000, you got to realize that there are very many types – inflatables, sit ins, sit ons, and so on. Moreover, there are countless brands and models on the market. Not all offer the features you’re looking for. Hence, you might want to go through our buying guide below. Here are the considerations you need to look at. Inflatable kayaks are made of elastic materials like PVC. They’re lightweight and easy to store and transport but on the flip side, they’re (generally) not as durable as the hard shell kayaks. They tend to get torn or punctured. Hard shell kayaks are made of polyethylene or other blended plastics, and they’re generally more durable than the inflatables. On the flip side, they’re bulkier and trickier to transport than the inflatable models. An inflatable or the hard shell kayak might be a sit in or a sit on model. Sit ins are the most stable; there’s minimal risk of tipping over. However, they put you in a position where you cannot adequately see ahead. In our view, these are not the best for fishing. Sit ons are a little less stable than the sit ons, but at least you can see ahead. And as your legs are not held by some foot pegs, you feel freer and to sit, stand, and even move out of and back on the yak with ease. As you can see, each of these types has both pros and cons, but if you’re looking for the most user friendly, we strongly recommend you go for a sit on model. A stable sit on is great for fishing. Do you need a personal model for just you or do you need the kayak to be able to carry several people? What about transportation outside of the water? Do you have a big car to carry a large and heavy kayak or is your car smaller and can’t carry something large? These are some of the size considerations that you need to make. Obviously, if you need a kayak for personal use, then one seat will be okay. Be sure to look at the weight capacity to make sure the vessel can carry you. We recommend that you always subtract 50 pounds from the indicated weight capacity, just to be safe. Besides, you got to account for the weight of the items you’ll be taking on your fishing trip. For the size dimensions, we recommend you get a boat that is at least 10 feet long, so you have enough space to stay comfortable and keep your supplies. We’re talking about the weight of the boat. If you’re new to the activity, you better get a heavier model as it will be more stable in the water. But if you’re an experienced angler and you’re looking for speed, then you’re better off with a lighter model. When considering the weight, think of the ease of carrying the boat to and from the water. Generally, anything more than 60 pounds is difficult to carry. Lighter models in the range of 30 to 50 pounds are easier to carry. Then again, remember that the ease of transportation doesn’t just depend on the weight of the vessel. Features like handles or gripping surfaces at both the sides and the front and back of the boat make the transportation easy. Kayak fishing is not rocket science, but it’s different from fishing by the bank or fishing from a canoe. How? Kayaks, even the most stable ones, don’t offer you much freedom as they don’t have much room. And again, you have to think of your stability to avoid falling over. That said, there are people who do Kayak fishing almost intuitively and effortlessly. Here are some tips to help you master the art of fishing using a kayak. When the wind gets violent, or when you’re going against the current, you might have a hard time propelling the boat. In that case, you know what you need to do? Just move closer to the shoreline. There, the water is shallower, so the current is weaker. Again, the vegetation growing there mitigates the waves, making it easier for you to move. If you’re used to angling from the stable deck of a boat or the shoreline, then casting with one hand might be a little tricky. With the kayak, there’s not much space between the place where you’re standing/sitting and the water. The stability of your vessel is also not very good. Your yak might turn or sway away especially if there are strong currents or winds. For that, you might have to use one hand to handle the paddle and try to keep the vessel still and the other hand to cast the fishing line. If your paddle is too heavy to operate with one hand, consider getting a lighter one. How to operate the oar with one hand? Lock it along your forearm and use your arm to anchor it. That way, you can use it like a canoe oar and steer your kayak with relative ease. Yes, it seems a little strange, but you’d be surprised at the number of seasoned fishermen using this tactic. If you have a narrow kayak, consider putting your legs in the water from time to time and using them to steer your vessel. When you find a good fishing spot, and your boat won’t keep still, your legs can come in handy as an improvised rudder. Legs can also be very helpful when you want to redirect your vessel from an obstacle like a log. Make use of that eddy! Many beginners believe that currents are their biggest nightmare. It’s actually a misconception. A kayak is small and adequately lightweight to sit in an eddy. And doing so, the boat is prevented from going downstream, without having to use the oars. You can exploit the stability offered by the eddy to fish in one spot without having to tire too much paddling the boat. Crankbaits, chatterbaits, and other baits that offer resistance can be incredibly helpful for steering the boat. These baits create some resistance, pulling your vessel in the direction you’ve casted the line. So, be sure to cast precisely in a particular direction and exploit the resistance created by the bait to adjust the position of your kayak. If you’ve found a good fishing area, but you’re having trouble keeping your boat still, perhaps the right thing to do is anchor it. Though anchors are generally too bulky to carry in a kayak, they can be of much help. A claw model weighing 2 to 4 pounds should do. Exercise caution while using an anchor, especially when there are strong currents, as your boat may be pushed under water. A fast-release clevis will definitely be helpful. From waterfalls and sun exposure to dehydration and drowning, the risks of kayaking are quite considerable. But does that make the activity dangerous? No, it doesn’t. Like every other sport, kayaking has its risks. What is important is to know about these risks and to take proper precautions to make sure you’re safe. Let’s explore some kayaking risks and see how to kayak safely. When exposed to the sun for hours, you might suffer sunburns, dehydration, sun stroke, and heat exhaustion. What makes it even worse is that water reflects sunlight, and as you’ll on the water, lots of those reflected rays will land on your skin. These are serious issues that you have to think about if you’re going to be in the water for a long time on a sunny day. We’ve seen some people take an umbrella when going kayaking and it seems to work fine. Try applying sunscreen and put on a big hat; these too might help. There are two main reasons why you might get dehydrated while kayaking – sun exposure and energy usage while paddling. If you feel dizzy, exhausted, very thirsty, and a little disoriented, these might be signs that your body is dehydrated. In that case, you urgently need water. Needless to say, you should NEVER drink lake water. In fact, if it’s salty, it’s only going to dehydrate you more, possibly to a deadly level. So, one of the supplies you should ALWAYS take is fresh drinking water. Carry a few bottles. This is VERY important – lightning and water never mix well. If you’re caught in the middle, you might be electrocuted. Of course, a little rain is okay, but if you hear thunder, it’s time to get off the water. And QUICKLY. It goes without saying that you should never go kayaking in choppy weather. Have you watched the Titanic? What happens at the end of the movie? The ship hits an iceberg and sinks, and many people are left floating on the surface of the cold water with their life jackets. But life jackets don’t save them. What kills them is not the water but the temperature of the water. They get a cold shock and die. An experienced paddler will tell you that paddling when its cold might not be a problem; the problem starts when you hit the water. Cold water immediately forces you to take a deep breath, and that might cause you to drown. And even if you don’t immediately drown, the cold water can cause vasoconstriction of your blood vessels and give you a heart attack. The first precaution is to avoid paddling in cold weather in the first place. Avoid paddling at night also, as the water is very cold then. If you’re not an experienced paddler and swimmer, don’t paddle alone. Go with a seasoned kayaker. Again, avoid going too far away from the shores. The longer away you are, the lower your chances of survival are if you experience a problem with your boat and cannot use it anymore. Something else you might want to do is to take a drysuit with you. If you’re feeling too cold while sailing, then you’re not dressed properly, and you need to put on something warmer. These are objects in the water that allow the water to pass but block solid objects like boats. Strainers can be natural, like fallen trees and their branches. Or they can be man-made, like rebar and grates. If you’re trapped in a strainer, the water pressure might force you under the water, drowning you. The way to mitigate against this risk is to avoid strainers at all costs. Paddling in a group rather than alone also helps, because if one paddler gets struck, the others can help him/her. Barriers like dams normally have the water flowing down to lower levels. As the water flows into the dam, it creates a turbulent that you’re better off avoiding. Why? It’s easy to get trapped and hard to free yourself. If there’s a dam ahead, a portage is much better than the risk of going through the dam. Just grab your kayak and go around the dam. Kayaks are smaller than other boats, and it can be hard to spot other vessels. But that’s not the real problem. The real issue is that the other vessels might fail to notice you. Considering that a kayak is smaller and frailer compared to bigger boats and ships, in case of impact, you’ll be the one to suffer. Hence, be vigilant and avoid other vessels. Also, try to make yourself visible. Wear a reflective jacket and if it’s foggy or dim, attach a light to your vessel. If you’re just getting started with kayaking, the worst thing you can do is go paddling in rough conditions. As a beginner, you had better start slow and move up the steps as you go. Start with the calm river and lake waters then try to handle rougher waters as time goes by and you improve on your paddling skills. You might also want to take kayaking classes or get training from an experienced paddler to grow your skills. The best fishing kayaks under 1000 aren’t found just anywhere. You cannot just walk to a store and say, “Hand me that,” and expect to get one of these. Of course, there’s a chance that you can get it that way, but do you really want to rely on guesswork? If you’re looking for a truly worthy yak without having to pay a fortune for it, here are the brands you need to be thinking about. Like most big brands, Lifetime began as one man’s idea. The founder was a committed father and basketball fan who just wanted to create a good family basketball hoop. He ended up expanding his project and in 1986, the Lifetime company was born. As signified by the company’s name, the mission was to create high-quality products that lasted. Initially, they only sold basketball hoops, and other products meant for the sport, but with time, they introduced new products. Kayaks were some of the new products, and they were made with the same principles, quality, and longevity, in mind. Today, this Utah-based brand is one of the biggest kayak producers in the world, and of course, one of the most trusted. Sundolphin history dates back to 1982. The company began a small family business, which, over the years, grew into one of the largest manufacturers of kayaks in North America. The brand is based in the same old town in Michigan where it was founded, despite the expansion in production and sales. Something else that hasn’t changed over the years is the care with which the boats are made. When it comes to kayak safety, Sundolphin has a special place in the market. Born in 2013, Vibe Kayaks is one of the newer names in the industry. Even though it has been in operation only for a few years, this company is already becoming a fascination among paddlers. The main perk that Vibe Kayaks brings to the table is the ability to support all skill levels. Having been built on a passion for outdoor living, fishing, and generally, the water, this brand combines some of the most awesome benefits. These include affordability, great looks, and useful features that make paddling a cinch. If you’re looking for a good inflatable kayak, you might want to check out what Sevylor has to offer. Sevylor’s founding road began in 1948 and in 1949, the brand got its international breakthrough. From then on, the brand got worldwide recognition as one of the most reliable suppliers of inflatable water vessels. Having been around for over 70 years now, the brand has lots of experience compared to other kayak producers. They also have resources, and they make use of some of the latest tech innovations to ensure their yaks are built with the highest standards. From quality to safety and affordability, Sevylor kayaks has all the benefits you can think of. Ocean Kayaks’ founder had a huge passion for scuba diving, and that led him to curve out his own kayaks. That was back in the 1970s. As people gained interest in his craft, the founder decided to venture into mass production of kayaks, and Ocean Kayak was born. When the customer base grew, and investors got on board, the company established a big permanent base in Ferndale, Washington. Rotomolding was also adopted as the main production method. The new vessels made of rotomolded polyethylene were tougher and more durable, and also more affordable. This helped grow the customer base even further. Today, Ocean Kayaks is one of the most preferred brands. When looking for the right under 1000 kayak to buy, the type is one of the most important factors you should think about. With that in mind, here are some of the most common types of angling kayaks. When it comes to fishing, sit-on-top is the most widely used type of kayak. This model has a shape like the normal sit-in kayak. The only difference is that instead of a hole at the cockpit, there’s an attached or molded seat where the user sits. When shopping, consider the comfort level of the seat. It should be padded both at the bottom and the back, and possibly adjustable. This is the traditional design, dating back around four millennia. The design is such that there’s a depression at or close to the center. It’s in this depression that you’re supposed to sit. In some top models, the sitting position is padded to give you more comfort, and the place where you lay your back is also padded. Mostly, sit-ins are suited for kayak sports and ordinary sailing rather than fishing. That’s because even though the vessel is stable, it keeps you more confined and fishing becomes more cumbersome. Though the two are the main methods of categorizing kayaks, it’s important to note that kayaks can also be grouped according to the material used to make them. In that regard, a kayak can be a hard-body vessel or an inflatable. While the hard-body models are more long-lasting, they’re bulkier and harder to transport. The inflatables are lighter and easier to transport, but they’re not as durable. If you have a good kayak, chances are that it’s resilient and will last a long time. But that doesn’t give mean you should be reckless with it or neglect your vessel. You want to keep your vessel safe from harm both in storage and when sailing. Here are a few ways in which you can take care of your kayak and ensure its longevity. Salt can corrode the hull and encourage mold to grow, leading to your boat’s deterioration. Thus, at the end of the day, don’t just throw your vessel into the storage room. Give it a quick spray and wipe is down to remove the grime and salt. Depending on the frequency with which you’re using your kayak, you might want to give it a good wash with soapy water and a scrubber from time to time. If you drag your little boat on the ground, you will only be thinning and weakening the bottom side of the hull. Eventually, the hull develops holes, basically making the yak unusable. That is why it’s advisable to use a yak cart. A yak cart also makes the movement out of the water easy for you. When you expose your yak to the sun for a long time, it’s not just the color that will fade. The plastic will weaken and start cracking. Over time, the plastic will be so deteriorated that it will easily get punctured. When you’re not using your vessel, be sure to keep it in the shade where it’s safe from direct sunlight. And when going out on a sunny day, spray the boat with 303 Protectant. This will ensure it’s adequately shielded from the harmful rays. One of the most important items to have with you on a kayaking trip is an emergency kit. The kit normally includes items like the first aid kit, emergency repair kit, and the bailout bag. Now, at the start of the kayaking season, you want to check the emergency kit for these supplies and ensure it’s properly stocked. Give the kit a refill as needed. When you’re not using the vessel, and the cockpit is uncovered, leaves, dust, little insects, and rain water might collect in the cockpit. These are some of the items that can deteriorate the vessel, so you want to keep them out. To do that, ensure you cover the cockpit well when you’re not using the yak. Once in a while, you should give your vessel a thorough inspection. Check the hull for holes and fix them or have a repair expert do it for you (if it’s repairable). Also, inspect all the accessories, especially the seat, the paddles, the rudder/skeg, and the paddle holders. If there’s anything that needs repair or replacement, be sure to work on that. Q1. Is a sit-on kayak better? If you’re paddling in very cold water and don’t want it to splash on you, or if you just want to stay dry, then a sit in kayak might be better. On the flip side, a sit in kayak keeps you confined, and you don’t have much freedom to move or even reach out for fish. If you’re on an angling trip, a sit-on kayak will definitely be the better option. It gives you more freedom to stand, sit, and even move in and out of the yak with ease. Casting and reeling are much easier when you’re using a sit-on model. Q2. Are longer kayaks better? The longer the kayak, the better the tracking, and subsequently, the easier the movement. Longer kayaks are generally faster than their shorter counterparts. For a tall person, a longer kayak is better as it has more room. Q3. Can my kayak tip over? Yes, of course, it can tip over, but that doesn’t mean it will. Kayaks sit low in the water, and hence they’re stable, and unlikely to tip over. But again, the ease of tipping over depends on the features of your kayak. A narrower kayak tips over more easily than a wider one. Another factor to think about is your experience. As you gain experience and become a better paddler, you’re able to control the boat better and keep it from tipping over even if it is narrow. Q4. How difficult is kayaking? When you’re starting out, kayaking might feel a little scary, hard even. But, as time goes by and you grasp the basics, you’ll discover what an incredibly easy and fun activity kayaking really is. Consider taking kayaking classes or have an experienced person help you out to learn faster. Q5. How much weight does a yak carry? Virtually all yaks list their weight capacity. That is the weight level that the yak can comfortably hold and move without a problem. But many people misunderstand the weight capacity. If, for instance, the listed figure is 400 pounds, that doesn’t mean you can paddle it if you’re 400 pounds heavy. It’s always good to deduct at least 50 pounds from the figure for safety’s sake. If they list 400 lbs, don’t use the yak unless you’re 350 lbs or less. Remember, you’ll be taking supplies with you and these too increase the weight. If you’re fishing, the fish will also augment the weight. Q6. Can overweight people kayak? Yes; definitely. The trick lies in picking the right model. If you’re 350 lbs, for instance, pick a model with a weight capacity that is above 400 lbs. Also, get a wider yak that you can accommodate you comfortably. Q7. What should I wear when going kayaking? Experts say – wear for the water’s temperature and not the atmospheric temperature. The colder the water, the more the layers of garments you need to wear. Ensure that as much as possible of your skin is covered and well protected from the sun, and put on a hat if the sun is out. Cotton retains water, so it’s always recommended that you avoid it. Stick to garments that dry fast. Lastly, think about your comfort. If you’ll be kayaking for a long duration, you’ve got to put on lightweight clothes that fit snugly; not tightly. Q8. What kind of kayak should I use in the ocean? Unless you’re a seasoned kayaker, then you should use a sit-on. Only an experienced paddler should use a sit-in model. A sit-on enables you to spot other vessels better and avoid them. Again, it’s normally sealed, and thus in case it capsizes, it rolls back over easily. As mentioned earlier, the first step to finding the best fishing kayaks under 1000 dollars is considering one’s needs. Will you be using the vessel alone or with one or two more people? Be sure to get a model with the correct weight capacity and enough seats to accommodate all the users. Our buying guide above contains all the considerations you should make before buying, so we highly encourage you to have a look at it. If you found this guide helpful, we request that you share it with your friends, so they too can discover a kayak that will serve them well. Don’t hesitate to leave us a comment.